“Piñata”, a television commercial for Skittles Chocolate Mix, has been consistently winning awards since its launch in March 2008. The most recent was a gold at the CLIO Awards this week. The 45 second spot features a man dressed up as a pinata, a papier-mâché container filled with candy. The tag line continues the Skittles tradition: “Experience the Rainbow”. The Piñata custom from Mexico involves suspending a candy or fruit filled figure from a tree branch or ceiling and inviting children to break it. 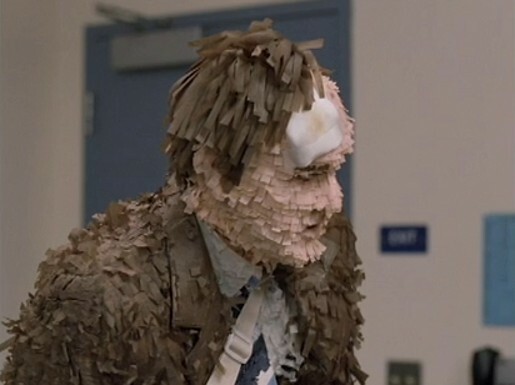 The pinata effect in the Skittles ad was achieved by attaching little bits of paper to Donellan’s face, allowing for natural movement of the mouth and eyebrows. Donellan wore a paper-covered suit, tie and jacket. Pinata was developed at TBWA\Chiat\Day, New York, by executive creative director Gerry Graf, creative directors Ian Reichenthal, Scott Vitrone, art director Craig Allen, copywriter Eric Kallman, agency producers Nathy Aviram and Laura Rosenshine, account executive Rachel Cohn. Filming was shot by director Tom Kuntz via MJZ New York with director of photography Bryan Newman and producer Scott Kaplan. Editors were Gavin Cutler and Erik Laroi at Mackenzie Cutler Editorial, New York. Visual effects were developed at The Mill, New York, producer Jo Arghiris, and Flame artist Angus Kneale. Colorist was Tim Masick at Company 3. Pinata has won awards at Cannes International Advertising Festival, 2008 (Silver Lion), the Art Directors Annual Awards, 2009 (Silver), International ANDY Awards, 2009 (Silver), The One Show (Gold Pencil), CLIO Awards (Gold).